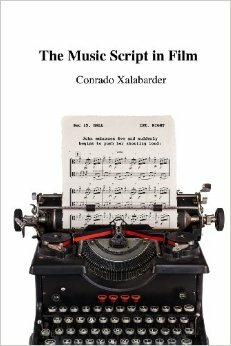 IMFCA member Conrado Xalabarder has released his newest book, The Music Script in Film, both in Spanish and English (translated by Australian author and novelist Gloria Montero). The book deals with the use of music in films, its effects on the audience (both emotionally and rationally) and emphasizes how to write a comprehensible musical discourse in a structured and orderly manner. The Music Script in Film, explains Xalabarder, is not about musicology, industry nor recording production. Neither this is a book of soundtrack reviews nor a biography of composers, but a theoretical/practical work that sets out the guidelines for creating a solid and structured musical discourse that works as a narrative. It explains the elements that make up film music and it is intended to be understood not only by musicians but by anyone. In fact, the primary purpose –besides helping composers- is to help film directors make decisions about music without fear or lack of confidence. Everything dealt with here is taken from what great film composers have used in the course of long decades and that is still pertinent in cinema today. My intention is to put order into the chaos that composers who work in film usually face, to allow them to be able to write a coherent and effective music script that will help to resolve the challenges and difficulties each film presents and make it possible for them to do their work not simply as composers but as film scriptwriters. This is not a book about music. This is a book about cinema.